Restaurant chain P.F. Chang's China Bistro got hacked recently, compromising thousands of credit cards. Oopsies. But business doesn't stop just because you got hacked, so in the short term the company is resorting to some old-school tech so that it can keep taking plastic. P.F. Chang's has already reported this incident to the card companies. 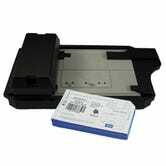 We provided manual credit card imprinting devices to all P.F. Chang's China Bistro branded restaurants in the continental U.S. to prevent any further potential exposure of our guests' credit and debit card information. The company operates roughly 200 locations in the United States and they all had to be rushed one of those old manual imprint machines with the slider and the carbon copy receipts. And the sound. Remember the sound?